Elizabeth the Queen by Sally Bedell-Smith was one of the many books about the monarchy which was reduced in the Kindle Jubilee sale earlier this. Unsurprisingly, it is a biography of Queen Elizabeth II, covering her childhood up to almost the present, ending in 2011 as she approached her Diamond Jubilee year in 2012. As an American, Bedell-Smith is immediately different to the British biographers I have previously read. She could perhaps be able to take an “outsiders” view of the Queen and the monarchy, not being a subject of the Queen, but in all honesty this is not an angle which she explores. Her style is generally respectful, and she seems to be one of the many Americans who love the British royal family, despite being proud of being a republic themselves. Another result of the author’s nationality are certain stylistic aspects of her writing, some explanatory sections, and her grammar and spelling. An example of what I would view as her American style is evident in the name of the book – Elizabeth the Queen. I don’t think this is a term any Brit would use to describe the Queen, but it does seem intrinsically American. 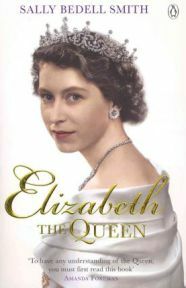 Additionally, throughout the book, Bedell-Smith mainly refers to the Queen as Elizabeth II, which is of course correct, but again this is a more American way of referring to her – most British-written biographies I have read use simply “the Queen” as the main way of referring to the subject of their writing, or occasionally Queen Elizabeth II. Bedell-Smith also includes explanations which are presumably aimed at an American readership which would not generally be required by British readers. She explains the concept of a constitutional monarchy and the Queen’s role, but the most memorable one for me was when she referred to the Queen and Princess Margaret being in a Girl Guide company at Buckingham Palace – Bedell-Smith adds in brackets that this is like the Girl Scouts in the USA. Guides are a global organisation, I was surprised that she felt this needed clarification. There were a few occasions on which the authors nationality showed in her spelling, as of course American English speakers spell some words differently to their English forms. One notable example of this is actually a very poor choice on the part of the author. She refers to a specialist medical centre in the UK which the Queen visits, and names it as the “Queen’s Center for…”. Now, using the American spelling for centre in the body of the text when not capitalised would be fine, but what she has done here is actually changed a name. There are other name errors, most prominently when Bedell-Smith calls Constitution Hill, Constitutional Hill. Elizabeth the Queen is a very long book, and as such is packed full of detail (although it is not as long as it first appears – approximately the final 30% of the Kindle edition is bibliographies etc). The level of detail included is impressive and interesting, however as the book went on I began to wonder about it. I have read quite a bit about the Queen and her family, yet there were a huge number of anecdotes in Elizabeth the Queen which I had never heard before. The Queen is famously private and very careful about showing emotion, yet there are numerous stories in here which do not match that image. Her friends and relatives respect her privacy and don’t talk, as do the palace staff, so I am doubtful as to the accuracy of a lot of these anecdotes. I am sure some, perhaps a lot, are true, but I don’t believe they all are. If so, Elizabeth the Queen really gives a very intimate portrait of the Queen and her life, and given her discretion and that of those around her, I really do not believe such an insight, at least an accurate one, is possible. That aside, Elizabeth the Queen is a fairly enjoyable read. Bedell-Smith’s style of writing is easy and light, and therefore lacks the authority that many royal biographers exude, but the book is enjoyable nonetheless. No Comments on "Elizabeth the Queen"